communicate information about their organizations. The goal of the 24th annual Celebrating Women Breakfast was to bring together nearly 2500 women to celebrate and honor The Foundation’s grantee partners and exceptional women leaders. 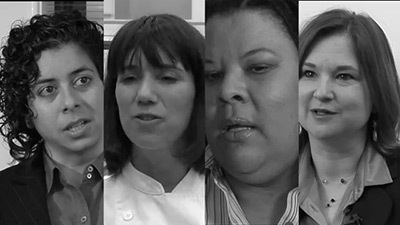 2010 Honorees included Mary J. Blige, Eileen Fisher, Margarita Rosa. The goal is to fundraise over $1 million dollars. The results were very successful! The New York Women’s Foundation surpassed their fund raising goal and raised $1.4 million. How did this video help? The video played a central role in the fund raising event. It opened the Celebrating Women Breakfast event, introducing The New York Women’s Foundation to 2500 people, educating them about the state of women and families in New York City. It shared the successes and progress that are possible for New York City women and families when we work together as a community. But its effect goes far beyond one-time premiere at the event; it is prominently featured on the NYWF website, on youtube, on their newsletters, end of year fund raising appeals, corporate events as an educational, fund raising, marketing tool. The video is a powerful tool to communicate about the mission and progress of a nonprofit organization using the voices of the people central and closest to the organization, that people outside the organization may have never had the chance to meet in person. For as little as $3,500, you can commission an original video to showcase your nonprofit in style at your next fund raising event or donor meeting. Our company, CharityDocs, has produced dozens of custom-made “mini-documentaries” for non-profits of all sizes, and we hope you’ll join our family of satisfied clients. CharityDocs offers you a remarkably low price on a 3 to 7 minute professional-quality video that spotlights your organization’s leadership, clients, and accomplishments. We’ll give you and your mission the kind of quick visibility-in-depth that only video provides. On the basis of this meeting, CharityDocs will prepare a brief proposal for your review. Our proposal will include an easy payment plan based on the size of your organization. With your written acceptance of our proposal we will consult with you as to what parts of your organization’s video “story” can benefit you most, and we will schedule shooting to capture that story. After shooting, the editing process begins, and we will seek your input again until your organization’s fabulous, totally customized mini-doc is complete. We can aid you to post your video online with live links to gift-giving, and we can deliver several, or several thousand, copies of the DVD to you. I had a wonderful experience working with CharityDocs. They were quick, efficient and very accommodating of my every whim. Their DVD is of the highest aesthetic and will be a great addition to our marketing materials—Elisa Monte, Elisa Monte Dance Company. This is so wonderful! I cried watching this — it vividly illustrates what we worked so hard to do and it does so with power, passion and people! WOW! It is obvious you worked incredibly hard on this and it succeeds wildly in telling our story. This is so wonderful! Having been awarded funds in 2012 to create several videos to showcase the history and services of the Lower East Side Harm Reduction Center (LESHRC), we commenced a search for a videographer who would not only capture the unique essence of our organization, the harm reduction philosophy which underlies the delivery of our services, and the dignity, compassion, and non-judgmental ethos which guides us, but also would be cost-effective for an organization with a modest budget.When we interviewed Mr. Wachter, we knew our search was at an end. In him we found someone with a very creative eye to capture those elements which we needed to emphasize as we presented our videos in different venues to audiences with differing perspectives. We found someone who was eager to understand the lives of those who we serve and Mr. Wachter did go out with our outreach teams to engage our participants within the surroundings which were familiar and engendered comfort for those participating in the making of the videos. We also were very cognizant of the fact that the quality product which Mr. Wachter produced was done very cost effectively and actually allowed us to produce two short videos and one hour-long video for a budget which was indeed modest. Mr. Wachter was very open to collaboration so that we achieved a finished product which admirably represents LESHRC and has been very well received and requested to be used by colleagues in the harm reduction community. Please visit our website at www.charitydocs.org, view our mini-docs. You can also take a look at our Youtube channel..Charitydocs…for even more recent work. I’d be happy to talk with you about your needs for a mini-doc and how CharityDocs can help. Please be in touch with me by phone at 917-716-9440 or via email to garywachter@charitydocs.org.